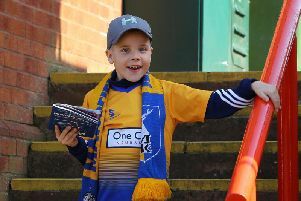 Mansfield Town once again fell at the first hurdle in tonight’s Carabao Cup tie as they were pipped 1-0 by League One Rochdale in a thrilling tie at a rain-soaked One Call Stadium. The Stags gave their all and almost forced extra-time when sub Danny Rose won a penalty eight minutes from time only to see Josh Lillis make the save with his legs. In the end the match was won by a goal worthy of winning any football match as Callum Camps curled the ball into the top corner from 25 yards. Paul Anderson came closest for the home side when he volleyed against a post on 29 minutes on a filthy night with incessant rain. Both sides deserve huge praise for producing such an entertaining full-blooded tie in such poor conditions. But, despite Mansfield’s excellent late pressure, classy Dale just had a little too much to let Stags get past this first round stage for the first time in 11 years. The pace of Omari Sterling-James and clever work by Paul Digby asked lots of questions of the League One side, but they had answers every time. In came Bobby Olejnik, Rhys Bennett, Paul Digby, Krystian Pearce, Jimmy Spencer and Omari Sterling-James in place of Conrad Logan, Zander Diamond, Jacob Mellis, Hayden White, Danny Rose and Lee Angol as Mansfield made six changes from last weekend’s 2-2 opening draw at Crewe. Stags had Olejnik and Spencer making full debuts and Digby and Sterling-James making their first full starts for the club as fans got to see seven of the 13 summer signings start the night. Bennett was back from a bruised foot to play against his former club alongside fellow former Dale player Atkinson, though ex-Dale keeper Logan was on home the bench. Ex-Stag Calvin Andrew, who once scored a local derby winner for Mansfield at Chesterfield, was on the Dale bench. In the opening minute Camps launched in a far post cross from the right where Williams headed over as Rochdale started the night with a statement of intent. But the home side might have done better on seven minutes as Atkinson intercepted a loose pass and raced down the right before drilling the ball to no one across the box. Great work by Digby on 14minutes set up a shooting chance for Anderson on the left of the box. But his near post effort lacked bite and was kept out easily by Lillis’ feet. Instead it was the visitors who drew first blood with a beauty of a goal on 17 minutes. A corner was cleared out as far as Camps 25 yards from goal and he curled a superb finish under the right angle to beat Olejnik all ends up. It was almost 2-0 on 25 minutes as Done broke well down the right but sent a low finish skidding across goal on the wet surface and wide of the far post. Four minutes later an Anderson corner was played back out to him. He tried to cross again but the ball ricocheted back to him and this time he met it with a vicious volley that came back off the far post. Seconds later a poor pass from Ntlhe gave the ball to Spencer who was inches wide with his low 20 yard finish. Benning got a good block onto a Camps shot and Williams sent an 18-yard shot at Olejnik as the visitors settled down again following the spell of home pressure and went in with that slender advantage. Four minutes into the second half Digby slipped a clever pass into the box where Atkinson buried a shot into the sidenetting from the right. Spencer did well on 57 minutes to pick out Sterling-James at the far post. But his volley sailed across goal and wide. Sterling-James then saw a low shot deflect into the keeper’s arms as the home fans got behind their side’s efforts. On 63 minutes Stags had a real scare as Ntlhe’s left wing cross came back off the home bar. Then Rathbone fired into the near sidenetting from Ntlhe’s pass. Stags made their first change change on 70 minutes as Hamilton replaced Byrom, then on 77 minutes Rose joined the action in place of Spencer before Potter was the last change three minutes later for Anderson. With eight minutes to go Rose won the chance to level the game from the spot, drawing a trip from Canvan in the box. But the keeper was able to block with his trailing legs as he dived to his left. Stags ended the game strongly with plenty of balls into the box and corners, but Dale stood firm. STAGS: Olejnik, Bennett, Pearce, Mirfin, Benning; Atkinson, Byrom (Hamilton 70), Digby, Anderson (Potter 80), Sterling-James, Spencer (Rose). Subs not used: Logan, Angol, Taft, Hunt. ROCHDALE: Lillis, Rafferty, Ntlhe (Andrew 90), McNulty, Canavan, Brown, Camps, Williams (Davies 65), Rathbone, Done (Inman 80), Henderson. Subs not used: Collis, Cannon, Morley, Kitching. REFEREE: Andy Madley of Huddersfield. CHAD STAGS MAN OF THE MATCH: Omari Sterling-James.